Friends, Paris. What can I add to the conversation about what happened last Friday? I’m devastated and so very sad. 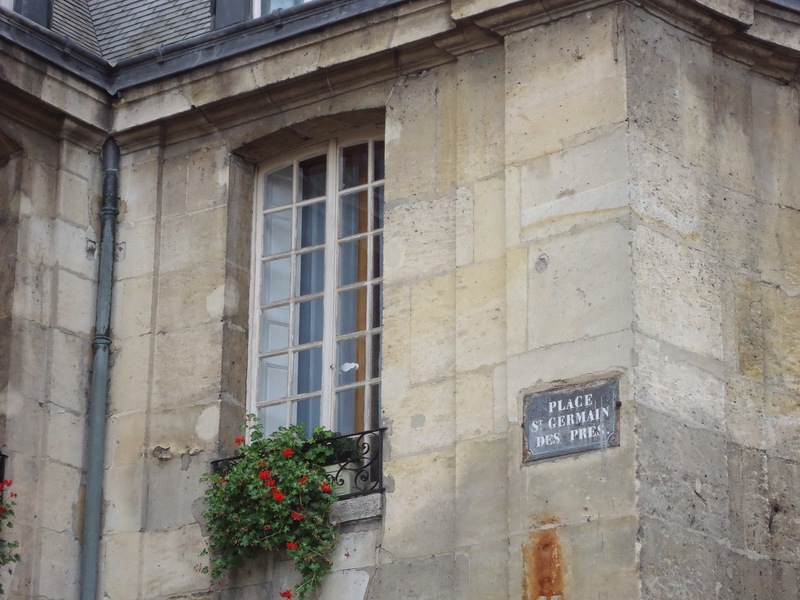 Paris is one of my happy places. I’ve always felt safe there. Safe and happy. 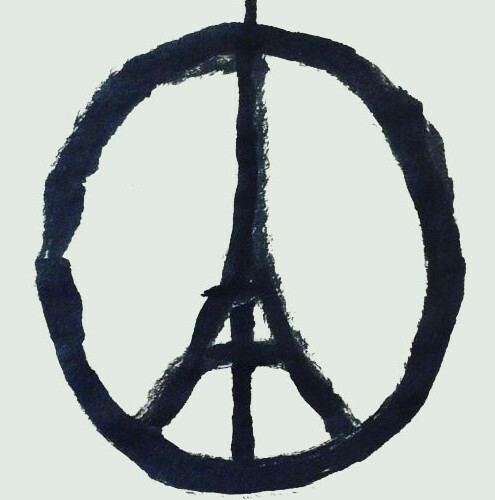 I’m heartbroken for the city and her people, for France and its citizenry, as they, like the rest of us, try to understand this very complicated world. 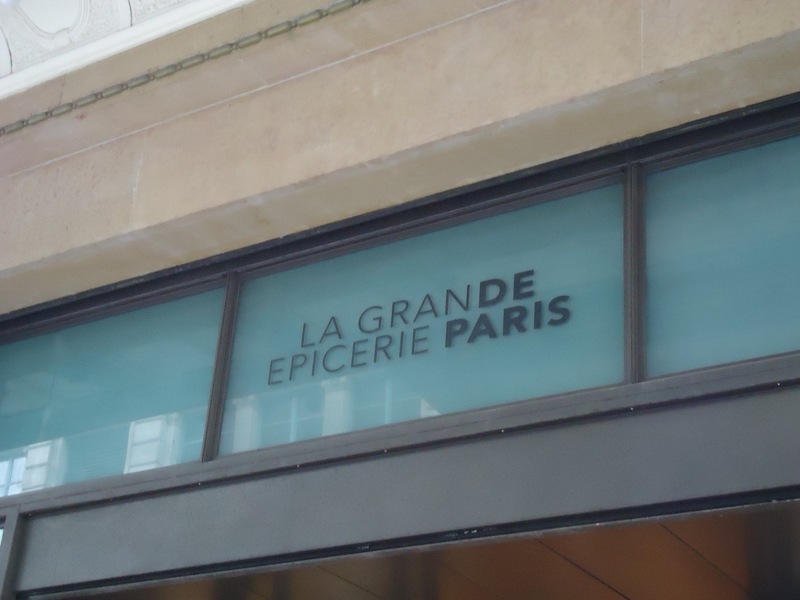 One of the bakers I follow on Facebook, Painrisien, posted a lovely sentiment on Saturday morning – that the boulangeries were open, even in the affected areas, and that the bakers were plying their centuries-old trade because life continues and bread is life. I closed my laptop then and set aside my phone. I went to my kitchen, another of my happy places, and took down the flour and sugar, pulled out the butter. Baking is my security blanket when the world gets crazy. I love the alchemy and the physicality, I love knowing that ingredients, mixed in the right proportions, will always become bread. Reflexively, I began making Pulla, my mom’s Finnish bread. I wanted the familiarity of baking by heart, the homey fragrances of w arm milk and cardamom, and the work of kneading the dough. Kneading bread, feeling it transform beneath my hands, gives me a soothing sense of control. Once the Pulla was set aside to proof, I washed the dishes and scrubbed the counters. I cleaned the stove and the floors. And it wasn’t enough. I needed more. 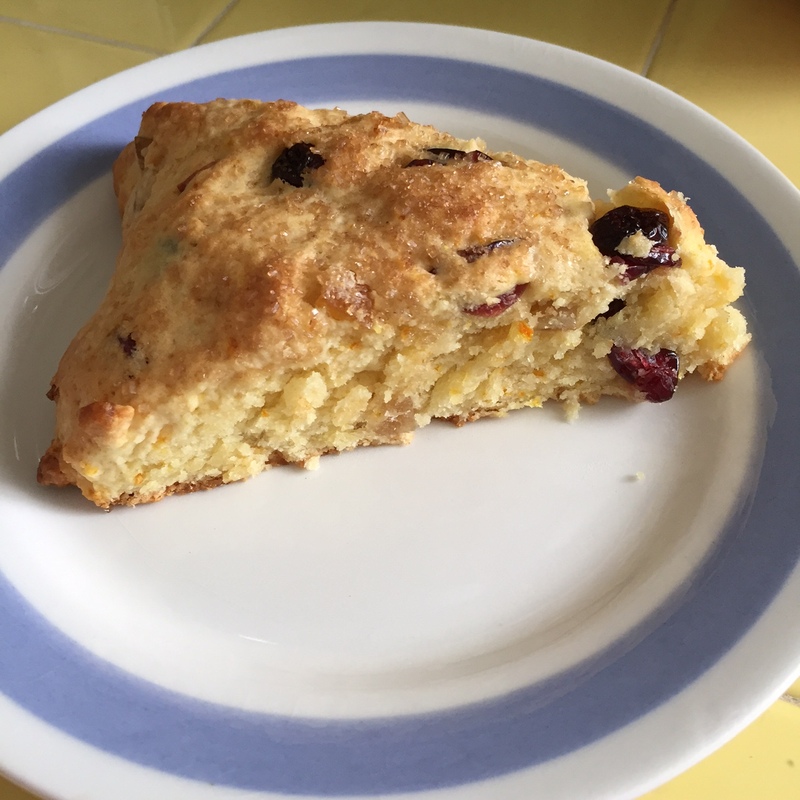 I scanned the cupboards and counters: There was the last of the candied orange peel, the rest of the chopped dried cherries/apricots/peaches from last week’s apple pie, a handful of dried cranberries. There was an apple in the bowl, an orange in the fridge. There was a dollop of creme fraiche and the last of a container of buttermilk. I shredded the apple and zested the orange. I mixed all the dried fruit together. Flour, sugar in a bowl. Eggs, crème fraiche, buttermilk whisked together with vanilla and a couple of spices. 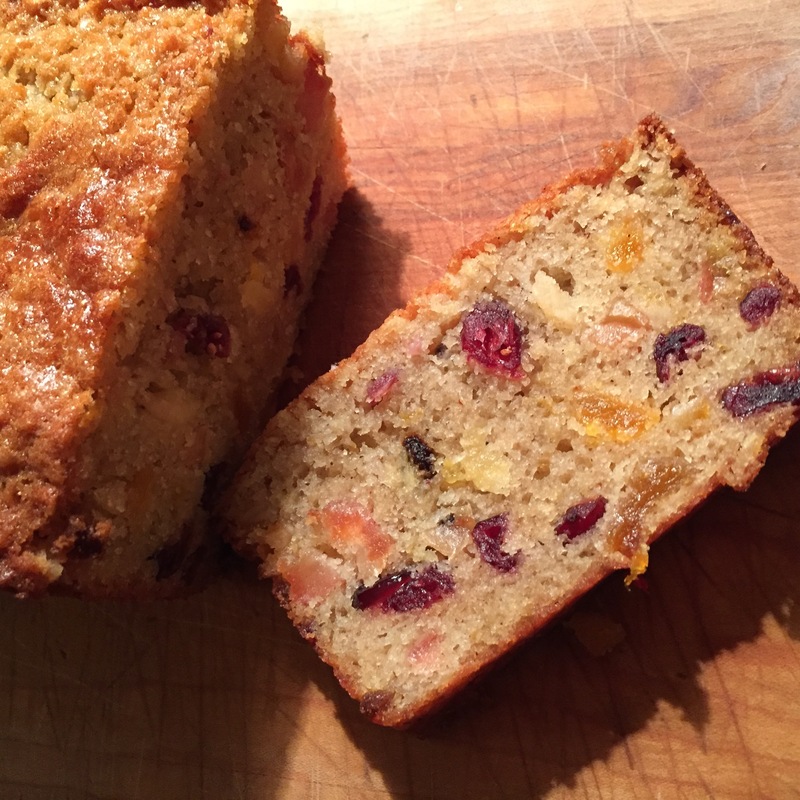 I combined it all and made what has to be said, is the most delicious quick bread I have ever had. Ever, no lie. It never fails. The joy, the pleasure, the magic of baking – it brings me back from the brink every time. Bread is life. Make the bread. Set the oven to 350F. Butter a 9×5-inch loaf pan and line the bottom with parchment. Set aside. Whisk together dry ingredients in a large bowl. Add dried fruit and stir to distribute evenly. Make a well in the middle. Whisk together eggs, crème fraiche, melted butter, buttermilk and vanilla, and pour into the well in the dry ingredients. Stir with wooden spoon until well combined. The batter will be thick and sticky. Scrape the batter into the prepared pan and smooth the top. Bake for about an hour, checking at 50 minutes. A tester inserted in the middle should come out clean. Cool in pan on a rack for about 10 minutes. Remove from pan, peel off parchment, and let cool to a warm room temperature. Wonderful with butter, or toasted with a little jam. And remember: If we stay away, if we become too afraid to go to Paris (or anywhere else our heart desires), the darkness wins. 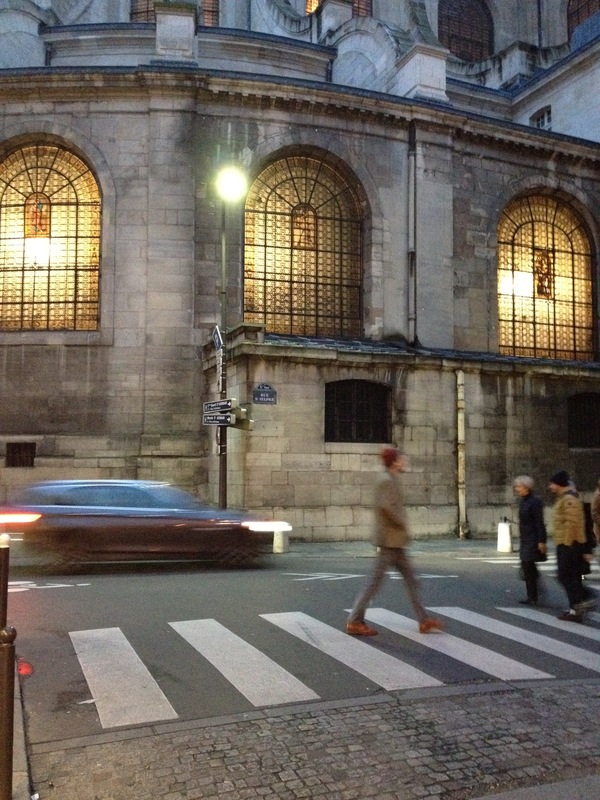 Which can’t happen, not in the City of Light, not anywhere. Blessings. It’s finally cooled off here in LA, with chilly evenings dipping into the 40s. I know to those of you in Chicago, Canada, New England, you scoff at these temperatures. But trust me, to our lizard-like, sun-on-a-rock constitutions, it’s puffer coat weather. Which as a native East Coaster, I love. I like cozy, I like pulling into the dark time, lighting candles, wearing my hairy house sweater, and making super easy, super delicious comfort foods. Which lately have been soups. All are ready in about an hour, using ingredients you likely have on hand. If not, all can be assembled from a quick run to Trader Joe’s (or your local market). 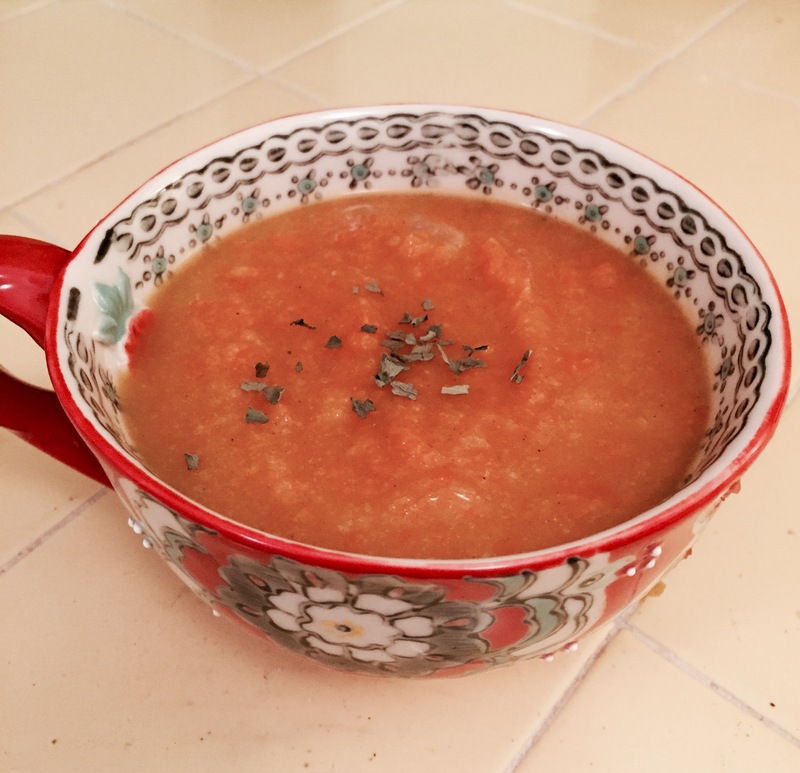 As to broth: I use chicken broth as specified in the recipes, but I’ve also made each using a vegetable broth. The lentil and carrot soups are great either way. 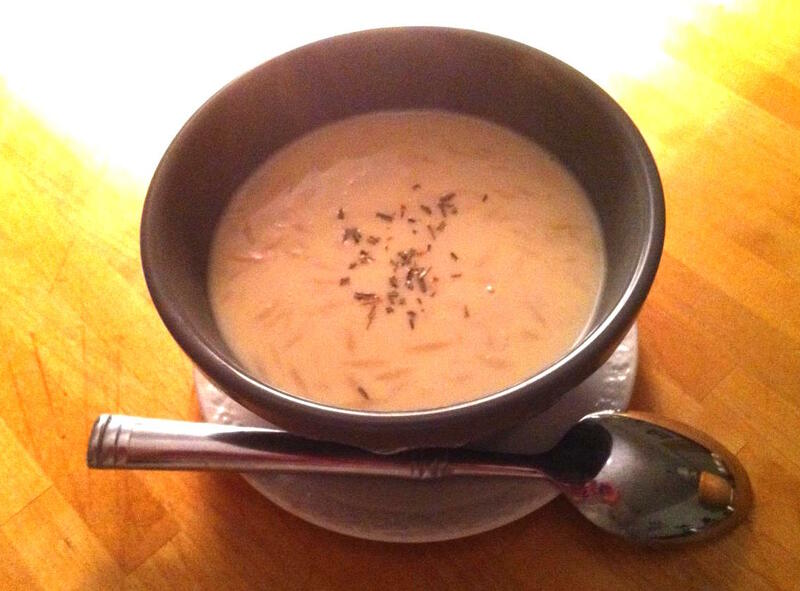 The Ovgolemono needs some doctoring to bring up the flavor profile – herbs, extra lemon, garlic. I leave the prescription to you if you’d like to make it vegetarian. Heat 3 tablespoons oil in a heavy soup pot or Dutch oven. Add onion, carrot and garlic, and cook over low heat until soft. Stir in thyme and a generous grinding of pepper. Add lentils and 8 cups broth. Bring to a simmer and cook until tender, about 45 minutes. While lentils cook, heat remaining oil in a skillet. Add bread and sauté over medium heat until lightly browned and crispy. Remove to a bowl. Add kielbasa to pan and sauté until lightly browned. Place in bowl with croutons. Set aside. When ready, purée lentils in a food processor in several batches, but do not allow to become perfectly smooth. Return to pot and reheat. If soup is too thick, add 1 cup or more of reserved broth. Season to taste with salt and stir in sherry if using. 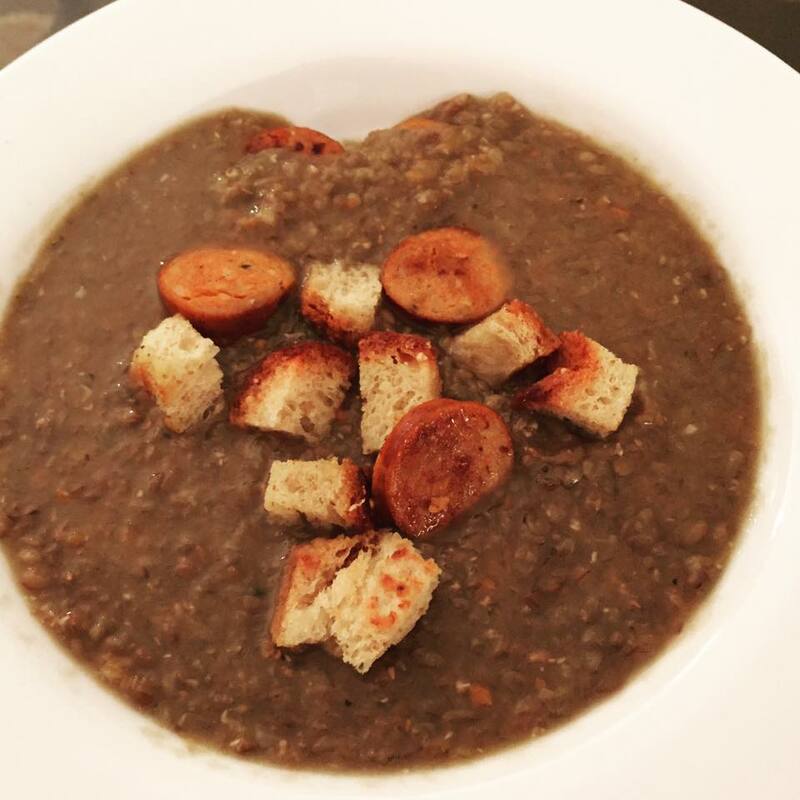 Serve, topping each portion with kielbasa and crouton mixture. This is so delicious. 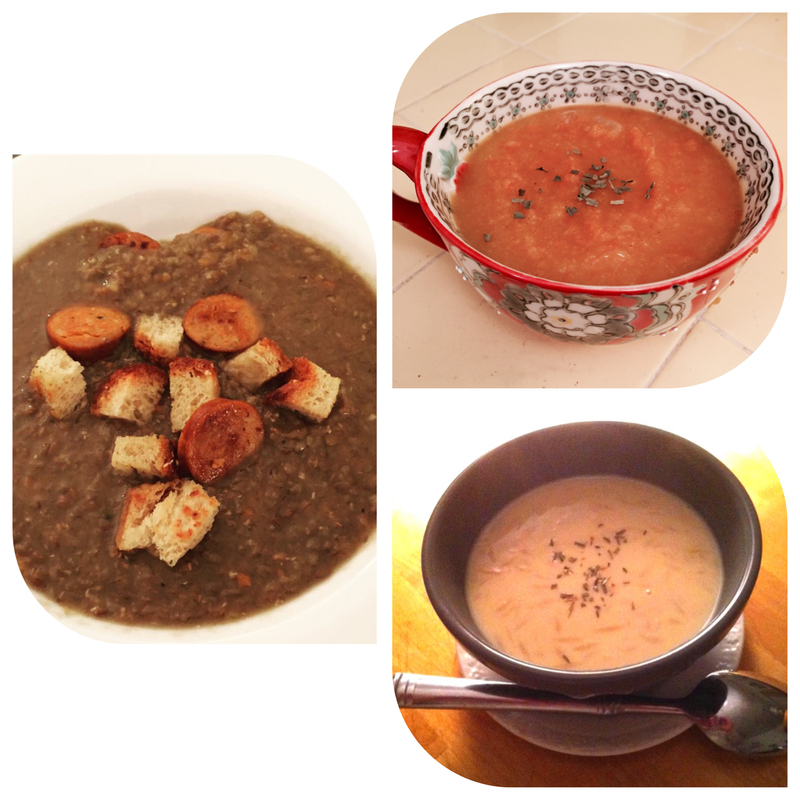 Even if you don’t care for lentil soup, I’m betting you’ll like this. My mom made carrot soup often. I’ve made so many variations over the years (Jane Brody’s is a particular fave) that this recipe is likely the result of many cooks. Melt butter in large saucepan over medium-high heat. Add onion; sauté until soft. Add carrots and apples. Stir together for 1 minute. Add broth; bring to boil. Reduce heat, cover, and simmer until carrots are tender, about 20 minutes. Drain soup in colander over a bowl to catch liquids. Return liquids to saucepan. Puree the solids in batches in food processor until smooth. Return to saucepan. Bring to a mild simmer over medium heat. Stir in the sugar, lemon juice, and spices. Season with salt and pepper. If the soup seems thin, let it simmer for up to 10 minutes, stirring occasionally to cook off some of the liquid. You can serve with a dollop of room temperature crème fraiche and snipped parsley. I enjoy it plain with a cheesy/harissa toast on the side. In a medium saucepan, combine broth and orzo. Bring to a boil and cook for 15 minutes. Combine egg and lemon juice in a medium bowl. Taste for salt, adding as needed. Serve with snipped chives. I like this with a frisee salad dressed in a mustardy vinaigrette (lunch), or with a couple of open-face grilled gruyere baguette toasts (dinner). My mom kept a tub of Crisco in the fridge. She’d toss some tablespoons of the cold shortening into a bowl of flour, cut it in, add some water, knead it together with her hands. She’d roll it out, line a pie plate. Fill it with cut up apples (skins on), cinnamon sugar, and dots of butter. Seal it with a top crust and bake it up. Delicious smell, delicious taste, with a modicum of effort. 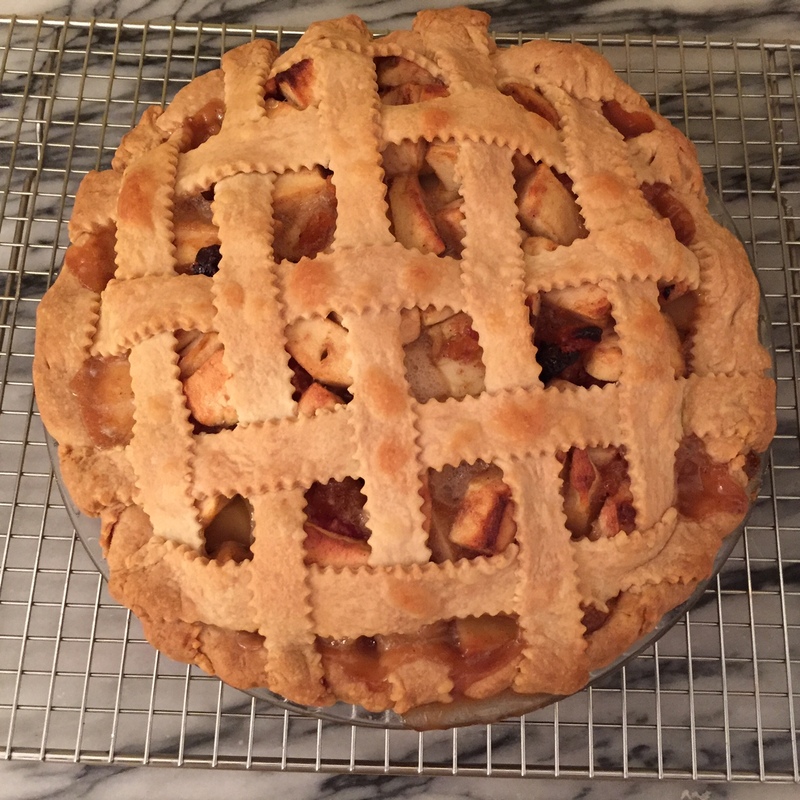 A terrifically simple apple pie. The same cannot be said for the day long endeavor of a pie I made this weekend. I’ll temper my remarks by saying that I’m not a huge apple pie fan. I like it. If it’s there I’ll eat it. But I’m not going to order it at a restaurant (no tarte tatin for me) or at House of Pies. But every so often I do want a baked apple something. And I had a new cookbook I was eager to try from an author I really enjoy. As to apples. Eating-wise, I only, ONLY, like McIntosh. Or the occasional Granny Smith. Baking-wise, I know the Delicious’s are meant to be the best, but I use Pink Lady. Because I like pink and because I like the quaint name. Just sayin’. You can use whatever apples you like. 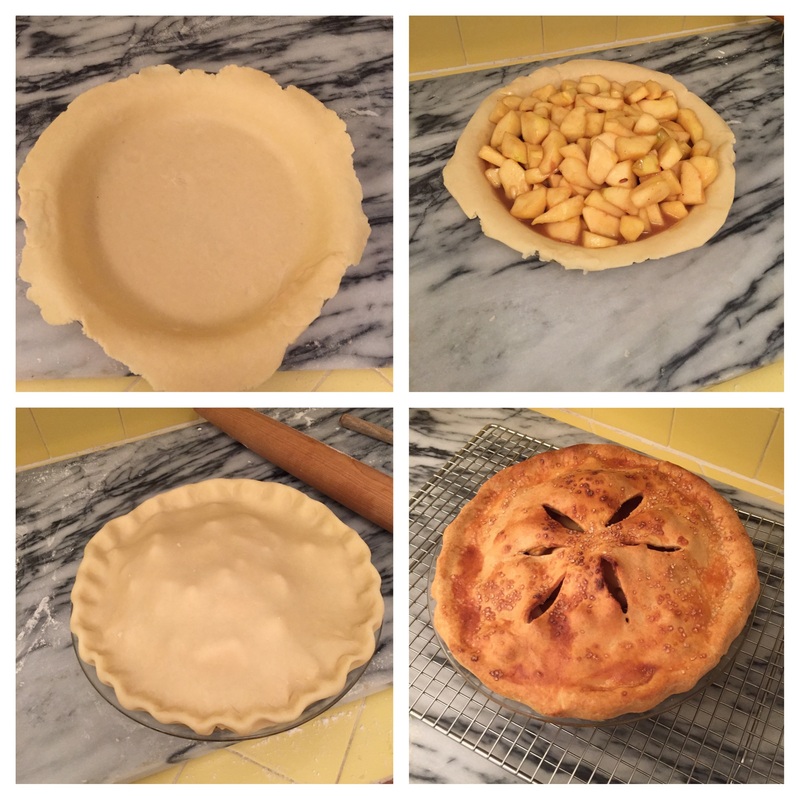 Back to the pie…. 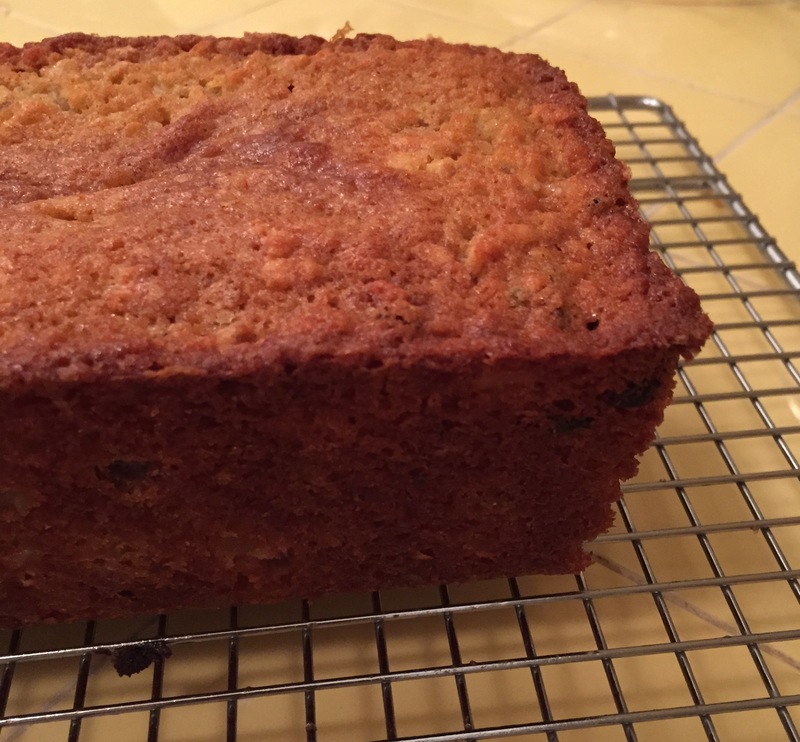 I read the recipe, or at least I thought I did, but throughout preparation I felt like it kept surprising me…. “Wait, what, I have to freeze this? I have to reduce this? I have to chill it for how long?” Perhaps it was a combination of my vision problem and the fact that the recipe preparation was written in long paragraphs. Whatever it was, it seems I can no longer work that way. I need bullet points. The instructions included lengthy macerating of apples, chilling of dough, chilling of pie, resting of pie, among other tasks and rests and waits. And in the end, after all that time and effort, the result was not as good as my mom’s 20-minute version and far less pretty. 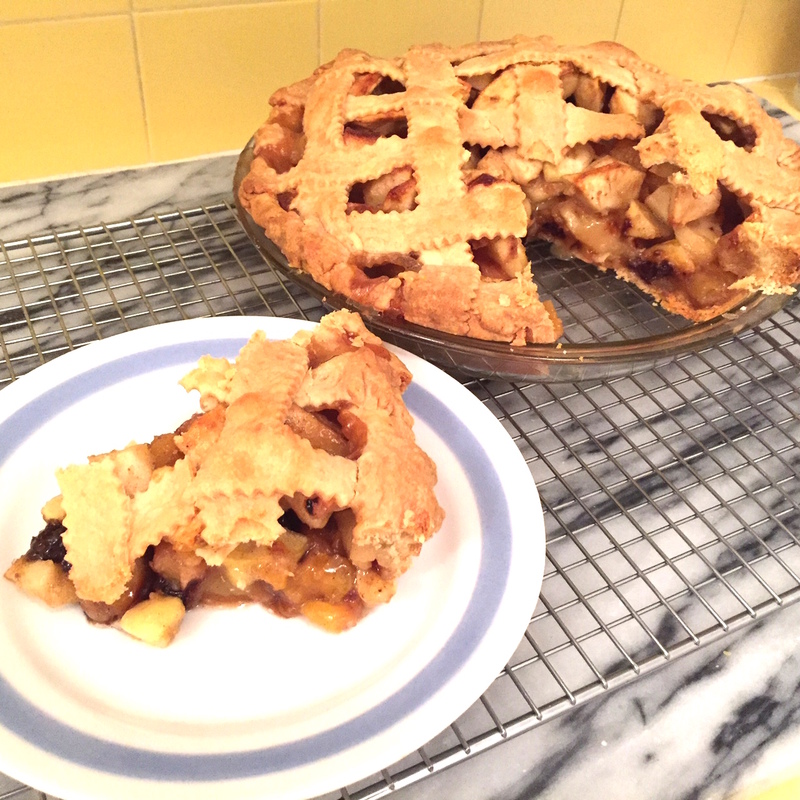 But, I like to win so I rolled up my sleeves for round two, pulling a recipe long stored in my digital recipe box for a Honey Apple Pie with Orange Lattice Crust. There’s OJ in the crust and dried fruit with the apples. What could be bad? Well, in my case, I don’t care for too much honey. But I read that you can replace honey cup for cup with sugar up to one cup. So I did, and added a little extra OJ to the fruit for moisture. The pastry was easy and fun. The apples – I used Golden Delicious as specified – didn’t macerate well, no juices were released. I thought the baking would take care of that. But check after check after check, my pie was just sitting in the oven, barely breathing. Orange zest in the crust in addition to juice. More sugar in the crust – as it, it’s great for a savory pie. It needs a bit more oomph. More dried fruit – it calls for 2 Tbs each of diced cherries, apricots and peaches; increase to 4 Tbs each, and soak in cognac along with the OJ. More spice in the filling. The cinnamon comes through subtly, the cardamom not at all. Jack up the spices to taste. You could also increase the sugar, although I like it not too sweet. Egg wash and sugar the lattice. It’s just prettier and tastes a bit more special. A great effort, but still not a total win. 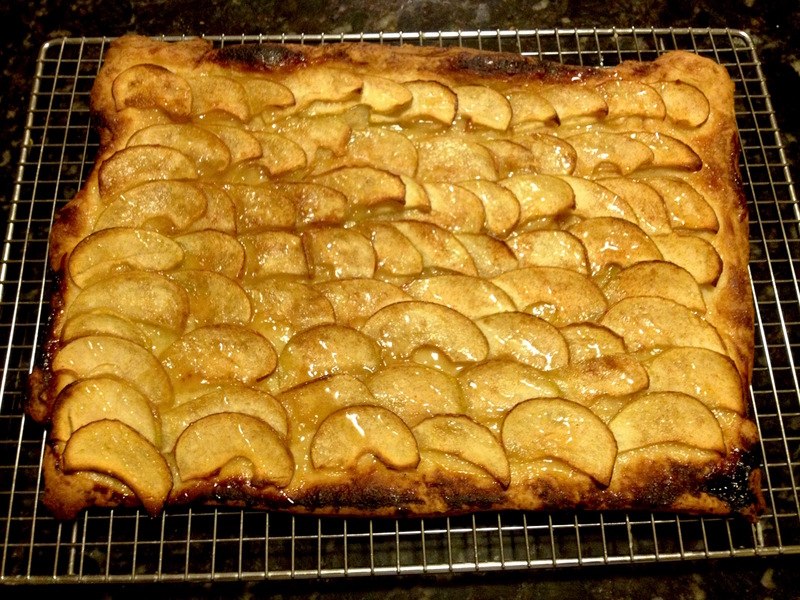 So I made what always works, what I call “Apple Pizza” which is just a version of Ina Garten’s Apple Tart. I like how pretty it is. And it’s fun to make, especially if you have a mandoline. And, ps, this pastry is also dreamy to work with. You can’t go wrong. A word on pastry: Get the slab. I always believed I was challenged in the pastry department. Years ago I bought a large plastic slab that had a rough surface. This was meant to be ideal for preventing pastry from sticking. It didn’t work very well, my results were not worth the effort. Then, a few years ago, I had a lovely large kitchen and an even lovelier large granite island. What ho pastry! Suddenly, I was better at this. Then, last year to combat my vintage tiled counters, I bought a marble slab. Now I’m a pastry ROCK STAR. Get the slab. Line a rimmed baking sheet with parchment or Silpat, set aside. Make the pastry: Put flour, salt and sugar in the bowl of a food processor fitted with the steel blade; pulse a few times to combine. Toss in the diced butter and pulse until the butter is the size of peas. With the motor running, dribble the 1/4-cup ice water down the feed tube and pulse just until the dough starts to come together. The dough should be a bit sticky. Add additional water as needed just until it comes together. Dump onto a lightly floured board and knead quickly into a ball. Flatten into a thick square, wrap in plastic and refrigerate for at least 1 hour. 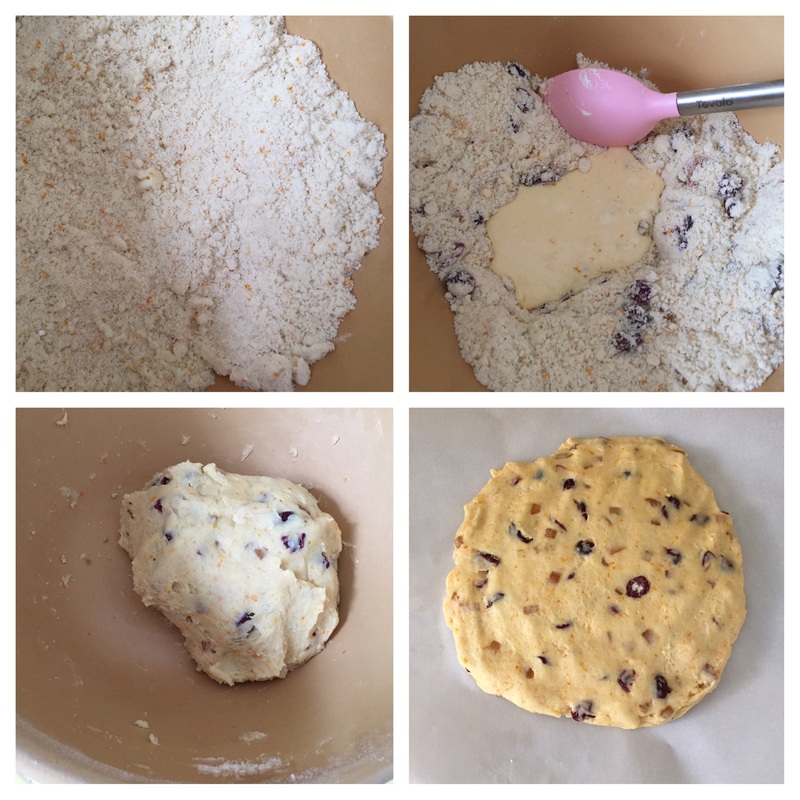 Roll the dough to about 10 x 14 inches, and pinch the edges to make a slight rim. 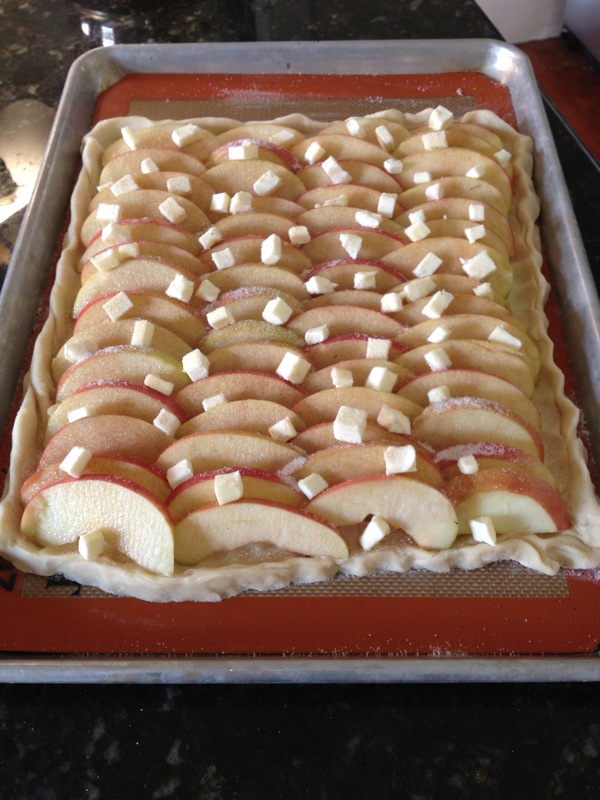 Put the rolled dough on the prepared sheet pan and refrigerate while you prepare the apples. For the apples: Core the apples and cut into quarters. Using a mandoline set to 1/8-inch, slice four of the apples. Leave the peel on. Put your sheet of dough in front of you, short side facing you. 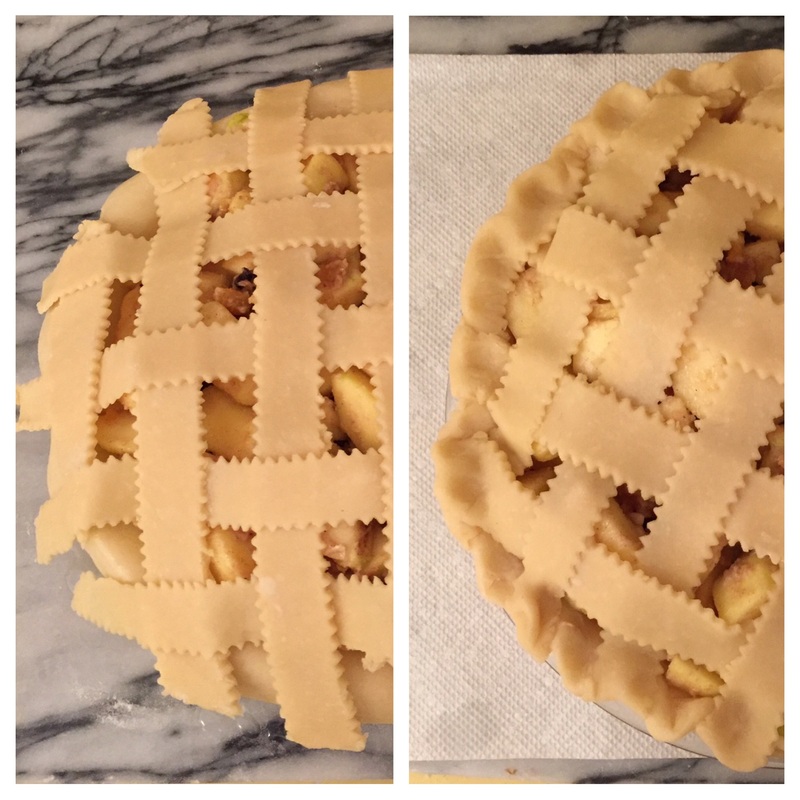 Places the slices of apple in slightly overlapping rows across the pastry. Try to be as uniform as possible, snacking on the smaller bits of apple. Cut up another apple or two if you don’t have enough slices. I got scared of the seemingly large amount of sugar. Note the difference in appearance between this and the photo above. Use your sugar! Mix the sugar and cinnamon together and sprinkle over the apples. It will look like a lot. Be strong and try to use all of it. Dot with butter. Brush the edges of the dough with the egg wash and sprinkle with Turbinado. Ina’s recipe calls for finishing with 1/2 cup apricot jelly or warm sieved apricot jam and 2 tablespoons Calvados rum or water. Heat the apricot jelly together with the Calvados and brush the apples and the pastry completely with the jelly mixture. Allow to cool. 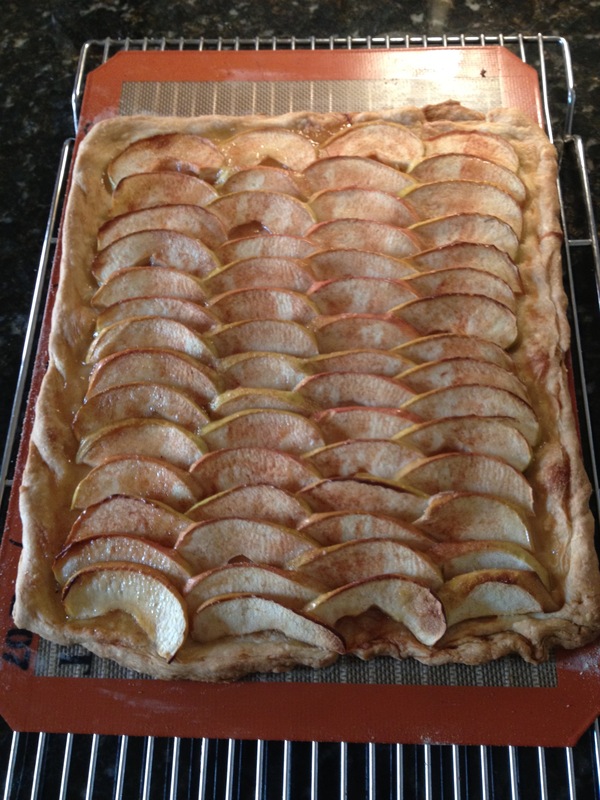 I occasionally make a larger rim of pastry and fill with a thin layer of pastry cream before placing the apples. Because pastry cream. I hope everyone had a gentle “fall back” on the weekend. I, myself, fell into a Bloody Mary and sumptuous grilled cheese at the Napa Valley Grille. Followed by a nap. So my usual Sunday bake was not on. Monday morning, though, was a different story: I’d made a mushroom pasta on Friday so had leftover crème fraiche; I also had leftover candied orange peel from last week’s chocolate orange soda bread. I don’t know what that says to you, but it says scones to me! I’ve been making this recipe for so long I don’t remember its origins. All I can tell you is that it’s delicious and foolproof. And fun, if you get your hands in there. 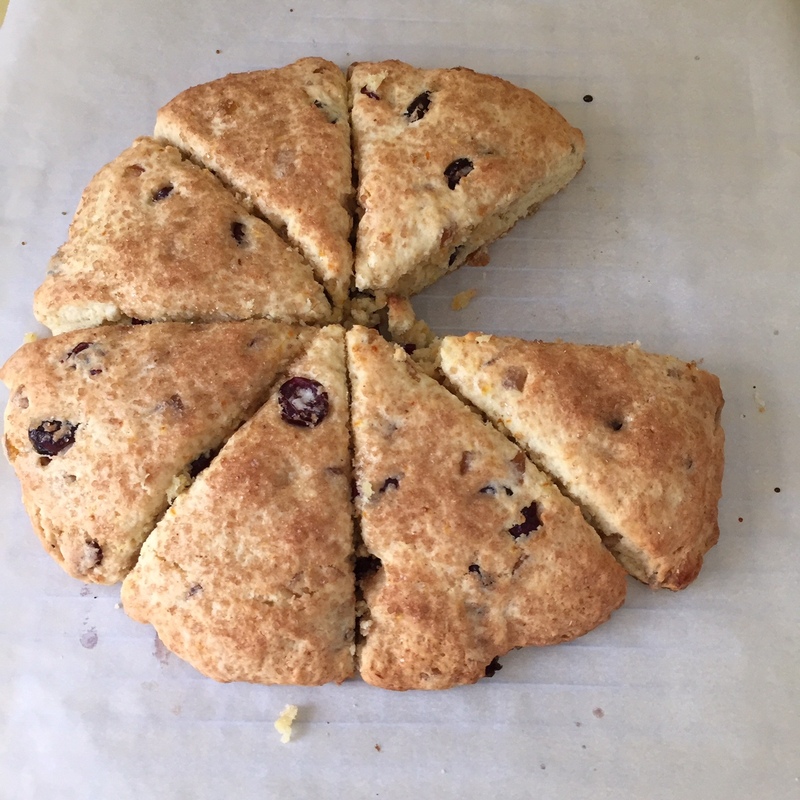 I read somewhere that Irish scones vary from the touch of the hand of the woman who made them. So if you cut in the butter with your fingertips, you’ll be part of a long tradition and you’ll impart your uniqueness to the dough. And you’ll have the tenderest scones ever. These come together fast and in one bowl. They’ll be ready pretty much when the tea is. Perfect for just about any morning, but especially great for Thanksgiving and Christmas. 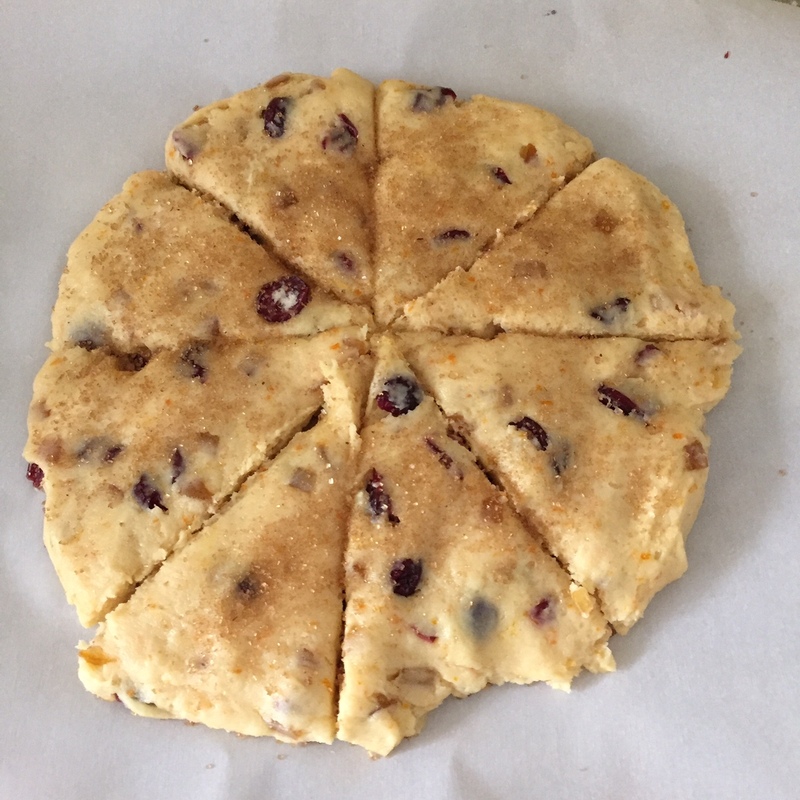 I’m calling ’em “Fall Back” scones, not only because that’s what we just did, but because they’re so easy, they’ll be your fall back breakfast in no time. Preheat oven to 425°F. Line a rimmed baking sheet with parchment paper and set aside. Whisk together flour, sugar, orange peel, baking powder, and salt in a large bowl. Add diced butter. Using fingertips or a wire pastry cutter, cut in the butter until the mixture resembles coarse meal. Stir in cranberries and diced candied orange peel. In a 2-cup measuring cup, whisk together the sour cream (or crème fraiche), orange juice and egg. Make a well in the middle of the dry ingredients in the bowl. Pour in the wet ingredients, stirring gently with a wooden spoon. Continue stirring until the dough just comes together and there’s no dry flour in the bowl. Knead the dough gently in the bowl for a few turns to eliminate some of the stickiness. Then pat dough into an 8-inch circle on the prepared bakin g pan. Using a pizza cutter, cut the circle in half one way, then in the other direction. Then cut across in a diagonal to create 8 equal wedges. Use the edge of the cutter to scooch them apart a little bit. Sprinkle with a generous amount of turbinado. Bake until golden, about 12 minutes. Let cool about 10 minutes before serving with lots of good butter and jam. (They are also fantastic on their own.) These keep in a Ziploc on the counter for a day or two, or in the freezer for about a month.